Im looking to get a pressure washer for cleaning my New Tundra and my driveway/house (brick). Is Gas the better option or electric? I see some top Eletric are very high (Kranzel) but gas might be noisy but has more pressure (yes i know you dont want 3200 psi hitting the paint). Foam cannon better on gas or eletric? What do you all use? ...does the job for a reasonable price. The subaru pressure washer that Costco is awesome it has a soap tank and tip for the wand and it soaps your car like crazy and it comes with other tips including one that brings the pressure to 3200 and it will cut concrete. Thanks for the replies!! The foam cannon on Amazon i see a couple for 17-20 bucks do they work good compared to 70 bucks for a chemical guys one? MTM Hydro Professional Adjustable Foam Cannon with Bayonet, 2600 PSI https://www.amazon.com/dp/B00EDSLVQC..._AP5EybJFR4BKG is the one I bought. It works perfectly! And a gallon of Mr. Pink makes great foam. Last edited by trufunk; 01-15-2017 at 10:55 AM. You will get a million answers on the power washer but a Gilmour Foam gun is hard to beat. I know sometimes what I see is not what everyone else sees. If you are a fan of fat girls, Dave Matthews CD's are better than a ham on a fishing pole. Last edited by OkSlim; 01-15-2017 at 11:47 AM. Industry standard pressure washer in the oil patch up here is Hotsy. Heat is mandatory if serious cleaning is desired. It makes all the difference but $$$$$. I don't care about the environment. Neither do you. I own that one and a Craftsman. Happy with both, but the Subaru is a better unit. listen to me, and listen closely if you value your beer drinking time and have a large flat vertical surface to clean then you must and you will get an attachment similar to this, I own this one but got for under 30 on a silly Lowes deal, its the best accessory you can get for your power washer. You're welcome, you can thank me later because you will! Last edited by Bob Dobalina; 01-15-2017 at 07:26 PM. X2 on the Hotsy, it is the perfered method out here is the West Texas oil patch. I'm using a Kranzle 1622 with a 50' non marking hose and a custom spray wand I built for detailing. It's a simple 4000 psi handle with zero extension. Works amazing for whipping it around in tight spots. Paired with an Uber/MTM foam canon. Gilmour garden hose gun is just for light sudsing at best. You'll need a foam canon and pressure washer for proper, thick foaming. 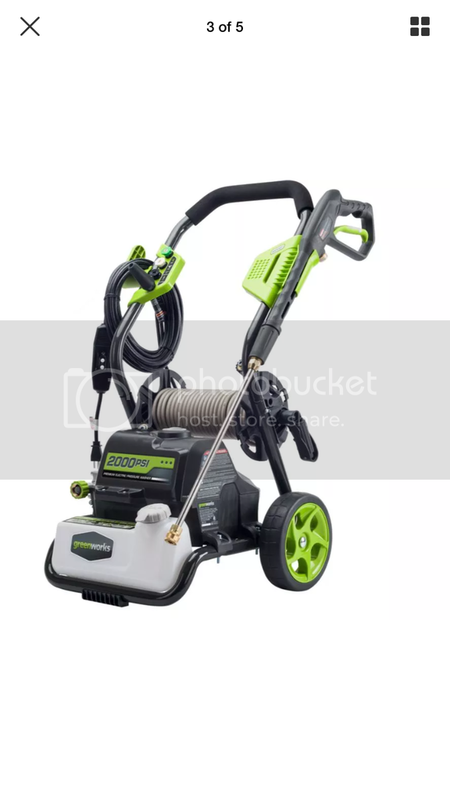 I've tried quite a few electric Home Depot/Lowes pressure washers and they all were throw away, junk machines. The Kranzle is German made, it's a tank. It has the ability to run dry as well as pull its own water source from a lake or swimming pool. 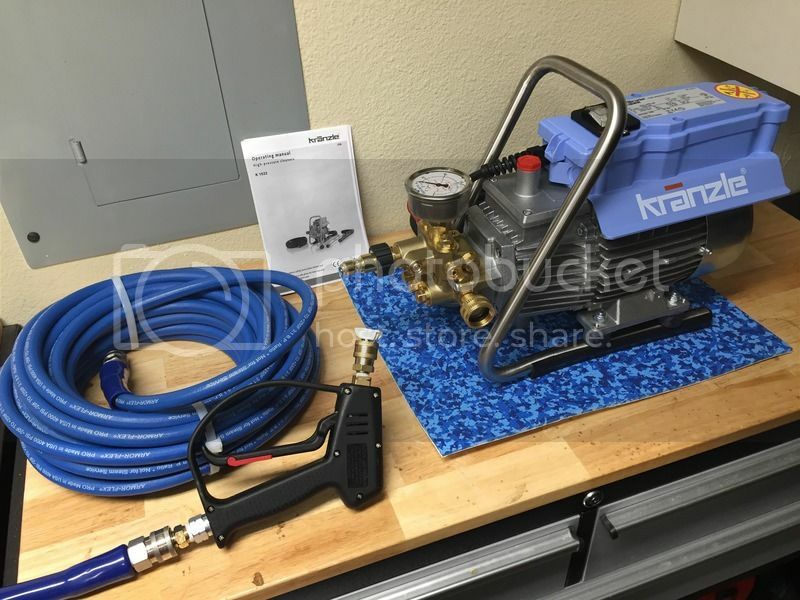 Kranzle does not use proprietary hose fittings. It uses industry standard commercial tips and quick connects. I have paired my Kranzle with an Eley wall mount, aluminum hose reel with a 100' Eley Polyurethane hose with Eley brass quick connect couplers. It's a great set up. Not all pressure washer spray tips are the same. Even though the color codes for the spray patterns are industry standard, be sure you are using the correct pressure tip for the GPM your machine uses. It makes a world of difference. You can find the size chart on MTM's website. Pressure Washers Direct is a great site to do your research too. They have a ton of info. Best of luck in your search. Hope you find a great pressure washer. Know the difference between a foam cannon and a foam gun. Gun does not use a PW, just a hose. Foam cannons come in two types, depending on the output of the PW.